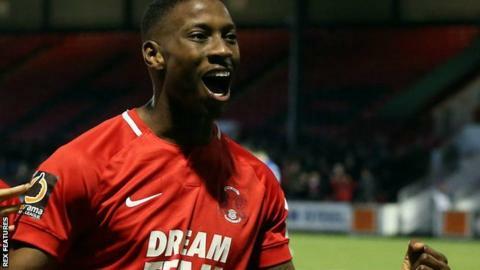 Leyton Orient eased two points clear at the top of the National League as they won a Wembley curtain raiser against fellow FA Trophy finalists AFC Fylde. Their two goals both came inside the opening 24 minutes to secure an eighth straight win in league and cup games for Justin Edinburgh's side, Orient's best run in seven years..
Marvin Ekpiteta headed home from a corner to put the O's ahead in the 15th minute. Macauley Bonne then struck from the penalty spot nine minutes later after James Brophy was brought down in the area. That wrapped up the points as Orient cashed in on nearest rivals Solihull dropping two points. Fifth-placed Fylde remain five points outside the fifth tier's top three. After booking their Wembley places in Saturday's semi-finals, the two sides are set to meet again at Non-League Finals Day on 19 May. Match ends, Leyton Orient 2, AFC Fylde 0. Second Half ends, Leyton Orient 2, AFC Fylde 0. Substitution, Leyton Orient. Dale Gorman replaces James Brophy. Marvin Ekpiteta (Leyton Orient) is shown the yellow card for a bad foul. Jordan Tunnicliffe (AFC Fylde) is shown the yellow card for a bad foul. Danny Bradley (AFC Fylde) is shown the yellow card for a bad foul. Craig Clay (Leyton Orient) is shown the yellow card for a bad foul. Substitution, AFC Fylde. Danny Bradley replaces James Hardy. Ashley Hemmings (AFC Fylde) is shown the yellow card for a bad foul. Substitution, Leyton Orient. James Alabi replaces Josh Koroma. Ryan Croasdale (AFC Fylde) is shown the yellow card for a bad foul. Substitution, AFC Fylde. Nick Haughton replaces Alex Reid. Substitution, AFC Fylde. Ashley Hemmings replaces Timi Odusina. Second Half begins Leyton Orient 2, AFC Fylde 0. First Half ends, Leyton Orient 2, AFC Fylde 0. Substitution, Leyton Orient. James Dayton replaces Jamie Turley. Lewis Walters (AFC Fylde) is shown the yellow card for a bad foul. Goal! Leyton Orient 2, AFC Fylde 0. Macauley Bonne (Leyton Orient) converts the penalty with a. Goal! Leyton Orient 1, AFC Fylde 0. Marvin Ekpiteta (Leyton Orient). Jamie Turley (Leyton Orient) is shown the yellow card for a bad foul.